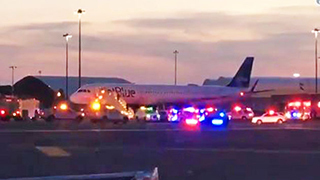 Police at New York’s John F. Kennedy Airport stormed a JetBlue flight Tuesday after a radio glitch caused the plane to send out a false hijack alert. A SWAT team stormed the plane and “told us to pull our phones away and leave (our) hands up,” a passenger told CNN. Police inspected the aircraft and determined that there was no emergency, however the plane still returned to the gate. Passengers boarded a new aircraft and left about four hours after the original scheduled departure.